Dual action balm to deeply cleanse and nourish, transforming a daily routine into a luxurious ritual for your skin. Gently removes impurities with delightful hints of lemon, lavender and cypress. A gentle organic facial cleanser with a mild exfoliant action: An effective makeup remover (of both synthetic and organic cosmetics), this cleanser also moisturises your skin, leaving it supple and soft, with a rejuvenating glow. 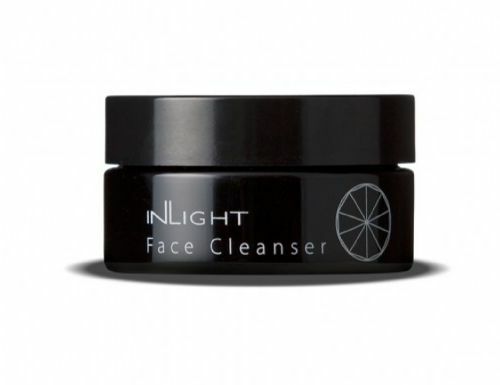 As with all Inlight products, the Organic Facial Cleanser is suitable for all skin types, including the most sensitive, or those with acne, rosacea etc. olive oil, green tea and rosemary. Apply a little Organic Face Cleanser with the wooden spatula provided and massage deeply into your skin and around the eyes with your fingertips. Use morning and evening. Rinse well after a few minutes with a face cloth, muslin or cotton wool, organic if possible, and the Inlight Floral Face Tonic. To use as a makeup remover, take up a little of the product on a cotton wool pad and simply wipe away the make up. (And before you reapply, we highly recommend our Organic Daily Face Oil as the perfect makeup base). You might find tiny white granules of condensed shea butter in this beautifood. This is a happy sign of the nature of our raw ingredients and they will melt on application. Enjoy! This product is suitable for vegetarians and is compatible with homeopathic treatment. Cleaning the face is the first step in maintaining good hygiene. This Organic Facial Cleanser has been designed to deeply cleanse your skin and remove all traces of makeup whilst simultaneously respecting the physiological and acidic characteristics of the skin. Coconut oil in particular, apart from its skin nourishing action, possesses antibacterial, antiviral and antifungal properties which are vital in achieving a proper and effective cleansing of the skin. The formulation is made up of a blend of nourishing oils (coconut oil and shea butter), those rich in Vitamin E and essential fatty acids (evening primrose oil, sesame oil) together with the soothing properties of olive oil and jojoba oil which promote skin elasticity. Added to these are the particular qualities of the herbs selected: astringent (green tea, lemon, cypress), stimulating and toning (ginger), anti-inflammatory and cytophylactic (lavender), antibacterial and purifying (clove buds, rosemary). The product also has a mild exfoliant action which assists in a deep skin cleansing by removing the outer layer of dirt and dead cells. The result is a glowing, toned and rejuvenated skin. The Organic Facial Cleanser is suitable for people with any skin type, including those with reddened skin, acne, rosacea, inflammation or darker patches from sun damage. It is particularly good for teenagers affected by spots and blackheads. Sesamum indicum (sesame) seed oil, simmondsia chinensis (jojoba) seed oil, olea europaea (olive) fruit oil, cocos nucifera (coconut) oil, cera alba (beeswax), butyrospermum parkii (shea) butter, lavandula angustifolia (lavender) flower extract, lavandula angustifolia (lavender) oil, camellia sinensis (green tea) leaf extract, citrus medica limonum (lemon) peel extract, rosa canina (rose hip) fruit extract, eugenia caryophyllus (clove) flower oil, cupressus sempervirens (cypress) leaf oil, oenothera biennis (evening primrose) oil, rosmarinus officinalis (rosemary) leaf extract, zingiber officinale (ginger) root extract, rosmarinus officinalis (rosemary) leaf oil. Linalool*, eugenol*, limonene*, geraniol*, isoeugenol*. *Natural constituent of essential oils. ** Allergens are natural constituents found in some of the organic essential oils we use and, even though they are present in a very low percentage, by law we have to list them.